In the month of December, Learning Resource Center students received 1,152 hours of tutoring, bringing the Year-To-Date Total to 5,686 hours (please note that the YTD total starts over in July). 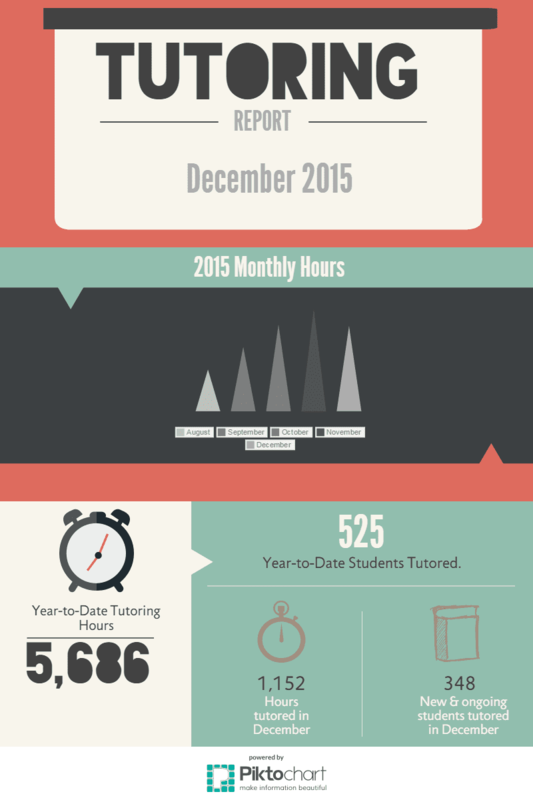 New and ongoing students tutored during the month of December equaled 348 students. See Them at For the Love… of Learning 2016! These three local celebrities will be in attendance at our 2016 fundraising event For the Love…of Learning on February 20, 2016. We hope that you will join us as one of our honored guests. For more details or to purchase tickets, visit LRCLoveofLearning.com. LRC’s own Jennifer Leigh of WFLA-Ch. 8 News Team will host the For the Love…of Learning 2016 program. Jennifer has graced the LRC event stage for more than 10 years, bringing her passion for education, love for children, and dedication to Polk County. Jaylen Arnold, an incredible LRC student, will be in attendance. 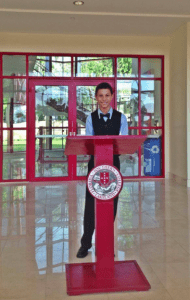 Jaylen is the inspiration for Jaylen’s Challenge Foundation, winner of the World of Children Youth Award, and a recipient of Ellen Degeneres’ Surprise Donations. 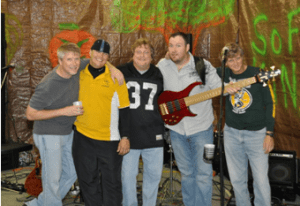 The Sofa Kings, an LRC favorite band, will provide an entertaining mix of pop, southern rock, and fan favorites for party-goers’ listening and dancing pleasure. This high-energy band always provides exciting entertainment. Please join us for an enjoyable evening of cause and celebration. We hope to see you on February 20, 2016! Have you already purchased your tickets onLRCLoveofLearning.com? Let us know by joining our Facebook event page. LRC has the unprecedented opportunity to log over 200 volunteer hours during this year’s signature Bar-B-Q weekend. LRC’s assignments include the VIP Sponsors’ Party on Thursday, January 27, and the team breakfasts on Friday, January 28 and Saturday, January 29. This year, however, LRC is also assigned to operate the 8-passenger golf carts which help shuttle people, equipment, and supplies on all three days. Two golf carts will run from 10 a.m.-5 p.m. on Thursday. LRC drivers will also operate 5 golf carts every hour from 7 a.m.-10 p.m. on Friday and 7 a.m.-6 p.m. on Saturday. PigFest proceeds will be divided between the participating non-profits based on the number of hours worked. 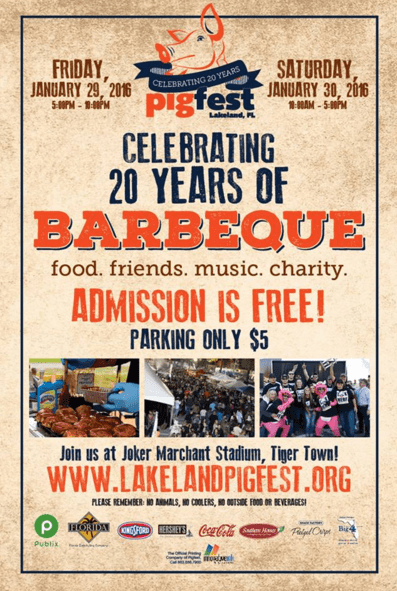 If you are interested in volunteering with LRC at PigFest, please email RebeccaT@LRCPolk.com. The 20th annual event opens to the public on Friday, January 29 from 5-10 p.m. and continues through Saturday, January 30 from 10 a.m.-5 p.m. at Tigertown in Lakeland. Over 150 competition barbecue teams will participate. Stop by for savory cuisine, lively entertainment, and a whole lot of fun! Celebrate the Learning Resource Center of Polk County, Inc.’s 40th Anniversary while helping children and families in the community at the annual For the Love…of Learning benefit on February 20, 2016. Join this evening of celebration and cause with festivities that include entertainment from The Sofa Kings, a world-class silent auction, and food catered by Terrie Lobb with the purpose of raising scholarship funds for students enrolled in LRC programs. The Polk County nonprofit hopes to top 2015’s fundraiser, which raised over $21,000 in scholarship funds and assisted more than 25 deserving students. This year’s event will take place at the spectacular Krakowski Family Home in Lakeland’s Grasslands from 7-10 p.m. on Saturday, February 20, 2016. Jennifer Leigh of Channel 8 News will serve as the mistress of ceremonies. Guests can purchase tickets to the benefit on LRCLoveofLearning.com for $65.00 (or $50.00 for LRC employees). Other ways to support the cause include becoming a sponsor, bestowing a scholarship, donating a silent auction item or contributing to the LRC Endowment Fund within the GiveWell Community Foundation. Those interested in sponsorships and donations should contact LRC Executive Director Dr. Pam Craven by email, PamelaC@LRCPolk.com, or phone, 863-688-9477 or send a submission at LRCLoveofLearning.com. Thanks to our current sponsors: Publix Super Markets Charities, Harrell’s, Drs. Dorsey & Sandy Hightower, Hunt & Mary Berryman, CliftonLarsonAllen LLP, and Citizens Bank & Trust. Make sure you’re prepared for the ACT and/or SAT. We’ve listed the 2016 dates and deadlines all in one place to make it easier. Scroll below to find the test date that works best for you. Make sure you’re prepared for the exam you choose with ACT Preparation. Ensure that you’re ready to take the exam of your choice with SAT Preparation. Find out what to expect with the new SAT, which begins March 5, 2016.